KF Mr Passport Success 2/8 "Dozer" is probably the most famous 40/0 son to date! This tremendous bull has a track record that just doesn’t end. He received 40 championship awards in his show career and is now breeding top quality red and gray offspring. "Dozer" has won back to back Premier ABBA Red Show Bull of the year titles--making him and his sire the only father-son duo to win back to back titles. 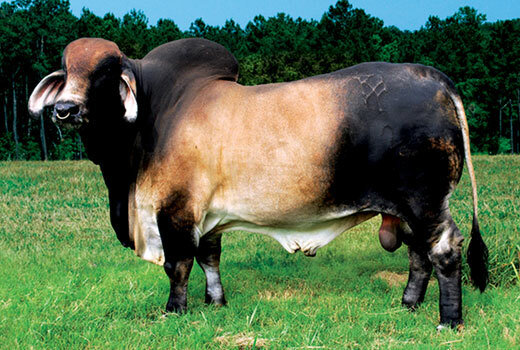 He exhibits all the qualities a Premier Show Bull should have--an abundance of muscle, spring of rib, depth of body and excellent topline that stands on tremendous bone and sound feet. He has numerous championships to his credit and is proving to produce offspring which will prosper in the pasture and top their classes in the show ring. Dozer, like his father, will breed gray on gray and red on red. © 2012 KBarFarms.com. Website design by The Brahman Journal.